SPOKANE, Wash. – Apprentice beekeeper Bethe Bowman never thought she would care so deeply about the humble honey bee. 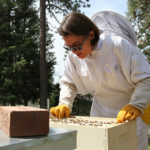 Taking beekeeping classes through Washington State University Extension, she installed two buzzing backyard hives, each containing roughly 30,000 bees, this spring. 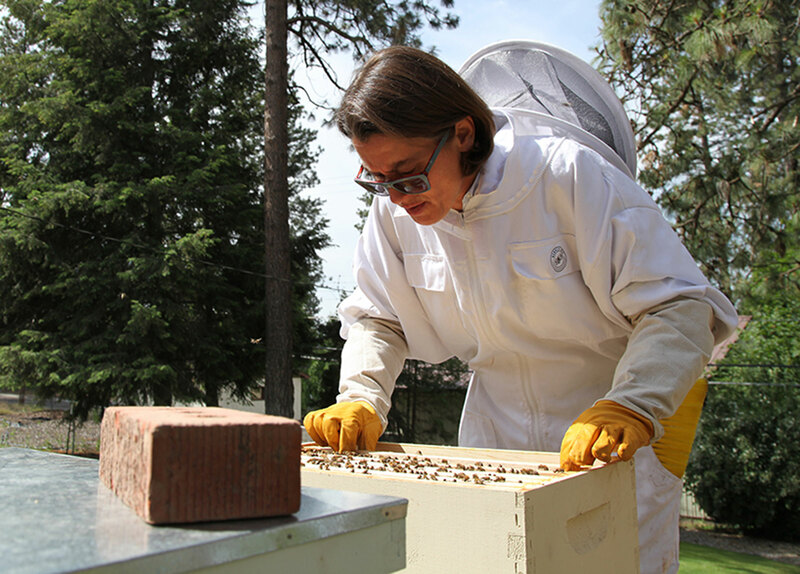 WSU Extension supports beekeeping courses in partnership with local beekeepers’ associations, helping people take their first steps as apiarists. “We’re graduating more than 100 beginners each year,” said Joan Nolan, an extension master gardener and a beekeeper for more than 40 years who organizes the classes with Spokane’s Inland Empire Beekeepers Association (IEBA). 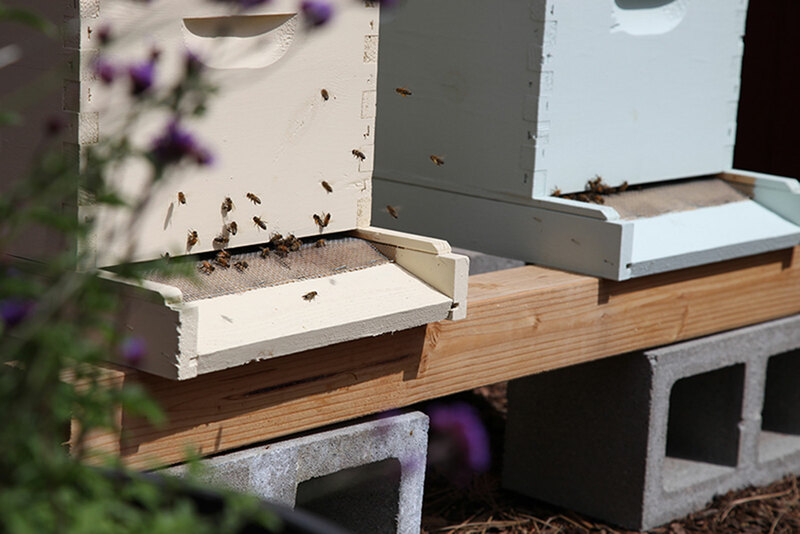 Interest in beekeeping has been growing, said IEBA member Matthew Liere. He takes part in the association’s mentor program for new keepers, including Bowman. “Honey bees are in peril,” said Nolan. Colony collapse disorder has affected large numbers of beehives throughout the United States and around the world, with 25 to 60 percent of hives lost each winter since 2006. There’s no obvious single cause, but entomologists suspect pathogens, parasites and latent pesticides may all play a role. “Colony collapse disorder has made people aware of the plight of the honey bee and its importance for our food, gardens and flowers,” said Nolan. WSU researchers are working to help honey bees survive. They bring new discoveries to the attention of beekeepers’ associations and are campaigning for a state-of-the-art research center to advance bee science. Before inspecting her hives on a warm June morning, Bowman carefully laid out her equipment, including a burlap-burning smoker that calms the bees, before gently opening the lid and easing out frames filled with comb. Parasites and predators, including tracheal mites and the invasive varroa mite, can wreak havoc on beehives. So far this spring, though, her new hives are healthy. Bowman, who co-owns a sustainably focused Italian restaurant in the Browne’s Addition neighborhood of Spokane, sees herself as a steward of the earth. 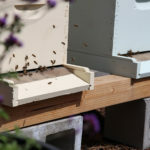 For prospective bee stewards, Bowman’s advice is to get connected. Extension courses are another great way to begin the beekeepers’ journey: “I’ve been so lucky that WSU finds bees important enough to do this,” Bowman said. More information about bee research at WSU can be found at http://bees.wsu.edu. Find out about beekeeping classes through WSU Spokane County Extension at http://ext100.wsu.edu/spokane/2015/07/22/basic-beekeeping/. Resources and information about bees through WSU Extension can be found at http://extension.wsu.edu/snohomish/garden/gardening-resources/bees-and-beekeeping/. Learn about the Inland Empire Beekeepers Association at http://inlandempirebeekeepersassociation.com/. Learn about the Washington State Beekeepers Association at https://wasba.org/.